Stay with us at the funky and friendly Le Monclair and you will be in the midst of Paris's 'must-sees' and 'must-dos'. We're located in Montmartre, only minutes from Sacre Coeur, one of the most popular meeting spots in Paris. Just within walking distance from our hostel you have your choice of museums, the famous weekend flea market at Clignancourt flea market, Sacre Coeur and the artistic district of la Butte Montmartre - and then when you are done exploring you can feel good about chilling out in a cafÃ© to watch the world go by, just like the Parisians. We have free luggage storage for those arriving and departing, as well as free breakfast, free maps, free linen and blankets and no curfew! The rooms are cleaned daily and our kitchen has been recently refurbished to provide everything you need to prepare your meals with friends. Our friendly staff will be happy to give you tips and ideas for inexpensive and fun activities or to reserve major attractions the likes of Disney, Moulin Rouge and more. We strive to make our common room fun and comfortable and the perfect place to meet our other guests. We're travellers too so we know that many times it is not about where you are as much as who you meet. Our formula is tough to beat because we have the beautiful, fantastic and magical Paris and a super friendly atmosphere. We're close to the post office, Metro, supermarkets, world-famous Paris bakeries, Laundromats, restaurants and clubs. There's private bicycle parking available. In case we're full, we suggest that you try the other HIPHOPHOSTELS located nearby. These include Regent Hostel, Square Caulaincourt, Le Village, Vintage Hostel, Woodstock Hostel, and Plug-Inn Hostel. Other hostels and budget hotels include Oops! 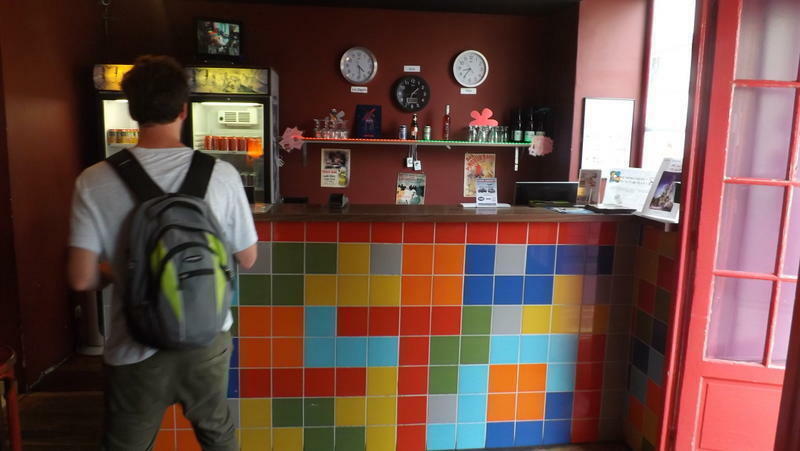 and Young & Happy Hostel in the Latin Quarter; The 3 Ducks and Aloha Hostel over near the Eiffel Tower and Absolute Paris which is located on Canal St. Martin. Each of us in the HIPHOPHOSTELS family (code for we all have the same owners). All HIPHOPHOSTELS are consistent, in that we have friendly and knowledgeable staff, we are all located in convenient and authentic areas of Paris and we all offer great value for the money. We're not cookie-cutter in that we are all the same. Like any family we all have our own personalities but we are sure a HIPHOPHOSTEL has something for every type of budget traveller. Please note that we do not allow guests under the age of 18 unless accompanied by an adult, with written authorisation from your parents before booking. Thanks for your understanding. From the metro station Jules Joffrin, you'll be in the front of the district's City Hall (you will see Liberte, Egalite, Fraternite written above the five-meter-high doors). Keeping City Hall on your right, head onto Rue Hermel. The first street on your left will be Rue Ramey, thats our street. Go 300 or so meters and youll find us on the left. If you get twisted around, give us a call! Take the metro line 4 to the station 'Marcadet-Poissonnier', change to the line12 and get off at the next stop 'Jules Joffrin', then folllow directions as above. Take the train RER B to Paris station 'Gare du Nord', then take the metro line 4 to the station 'Marcadet-Poissonnier', change to the line 12 and get off at the next stop, 'Jules Joffrin'. Then follow directions as above. Take the train RER B to Paris station 'Gare du Nord', then take the metro line 4 to the station 'Marcadet-Poissonnier', change to the line 12 and get off at the next stop 'Jules Joffrin'. Then follow directions as above. Take the metro line 4 to the station 'Marcadet-Poissonnier', change to the line 12 and get off at the next stop 'Jules Joffrin'. Then follow directions as above. Take the shuttle to Paris 'Porte Maillot', then take the metro line 1 to the station 'Concorde', change to line 12 and get off at the station 'Jules Joffrin. Then follow directions as above.